Art Box, an art studio in Coconut Grove, is hosting a charity event for the Hope vs. Cancer Foundation. Hope vs. Cancer aims to spread awareness of childhood cancer, raise research and clinical trial donations for children's cancer, and lift children's spirits as they undergo treatment "Pain, anxiety, and fear are part of a daily routine for children fighting cancer," says Tyler Stover, executive director and CEO of the Foundation. "Kids are very visual, and visual distraction during medical treatments has been medically proven to reduce pain, anxiety, and fear. Coping with the drastic cosmetic appearance effects of chemotherapy can also be very difficult on a child. They are conscious of their changes in appearance and can sense other people staring. Our custom temporary tattoos provide the kids with visual distraction and help provide a mental blanket of their appearance. We are often told that they feel like people are staring at their cool tattoo and not how they look," said Tyler. During this special event, anyone may stop by to donate what they would like to the cause, no matter how small. In exchange, they may receive a temporary tattoo of their choice, applied with water and a sponge. 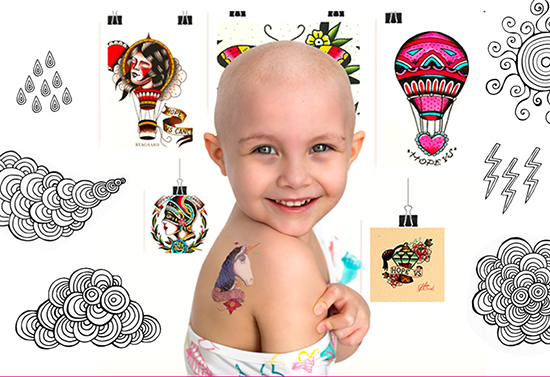 All the tattoos are donated works of art created by tattoo artists all over the world. This event will be take place Saturday, November 10, from 11 am to 3 pm at the Art Box studio, located in the Mayfair in Coconut Grove at 2911 Grand Ave, Suite 400E. To learn more, please contact Sofia at sofia@artboxmiami.com or 305-778-1270.